More as a learning and play kind of menorah...no hot fire involved! Set out your supplies making sure to cover your area for easier clean-up. 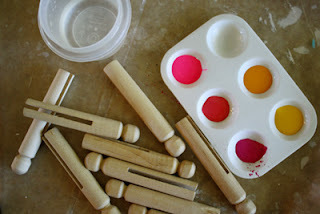 Have your kidlets paint up each clothespin in the manner that they choose. 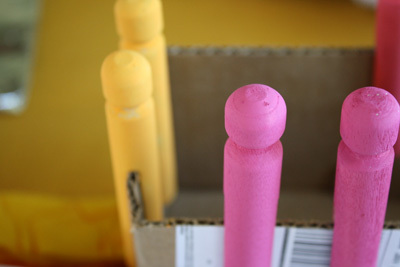 Go with all one color across the board or have your tots mix up their own colors. 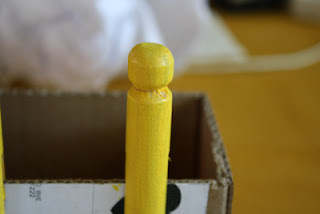 You can start with one color and add a little white each go to further tint up the color or add a little black to shade em out. It's all up to you and your young ones. Snuggle the paint happy clothespins over the edges of the box to dry. Gather up your felt and measure across the top of an unpainted clothespin to see how wide you need to set your "flames". If you wish, eyeball and do it yourself or turn this into a lesson in measuring and ask your kidlet(s) to give it a try. 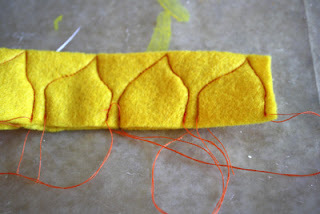 Practice drawing out some flame shapes on paper that match the measurements you took. When in doubt, a simple triangle will work. 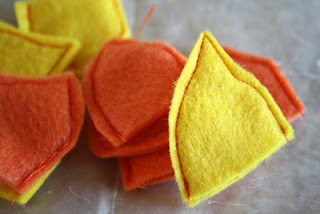 Cut out your flame shapes and then glue and/or stitch them up. You should have nine. 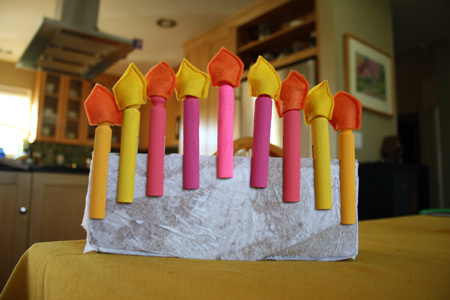 Create the menorah by gluing tissue paper to the outside surfaces of the box you used to dry your clothespins on. Arrange your clothespin candles on top of the boxes' edges and pop a flame on the center one if you choose and proceed to "light" one up each night of Hanukkah. If you find your clothespins slipping down and going all crooked, layer up a couple of pieces of tape to the inside of the box. It shouldn't take much to anchor your candles in place. When you are finished with the menorah play, your kiddos can use the box to store their candles. **I have a very bad habit of coming up with ideas in the middle of the night which causes much rushing around to write them down. If I were a better planner I would have one notebook with all my notes but I have many and this has been a project floating about for a few years now. Back when I thought of it, I took a cruise round the web to make sure I hadn't appropriated it from anyone else and proceeded. Then, since I took so long to actually make the darn thing I stumbled across this version (also done a few years ago) earlier today. So there you have it. 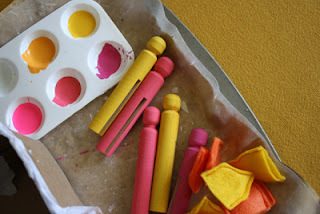 Serendipity and a couple of different takes on making a clothespin menorah. faces on the flames would be FANTASTIC! Im going to make one for myself and one to put in a Topic Box on religeons, that I will making up for our visually impaired children. Im making up topic boxes on all sorts of subjects, currently WW1 and Remembrance Day. I hadnt realised that in UK we had small crosses for rem day with the muslim syckle and the Star of David on, proving you are never too old to learn! Have made afew of your makes to use with our VI children, so many, many thanksfor the ideas. Love this menorah! Happy Hanukkah! I love it! Pretty, fun and colorful! Thanks so much, I'll be linking. Great project!! I love it. So cute! Love this!! I will definitely be making one for next year!